This is a Digivice Guide for the Digivice D3 Version 2 (US/EU/Asia), The D3 Digivice is another Pedometer Digivice. D3 Version 2 can be identified by a transparent casing and two arrows on the round button. Also on the Version 2, you must then choose a map location. Let’s start this simple guide. Block Game: Different shaped blocks cross the screen from the left, in two rows. Use the arrows to scroll through the different available blocks until you find one that will complete the oncoming block into a rectangular shape. Press the lower edge of the round button to move into the other row (this is the only use for it). Press the OK button to fire. If you complete a block, it disappears and adds to your score. If any block arrives at the right-hand side, the game is over. The distance remaining is reduced depending on how well you did in the game. Egg Game: You are shown three Digi-Eggs in a particular order, to memorise. Then you have to select the same three eggs in the right order from a list. It shows you your results and reduces the distance according to how many you got right. All Digimon can be scanned on the US D-Terminal. 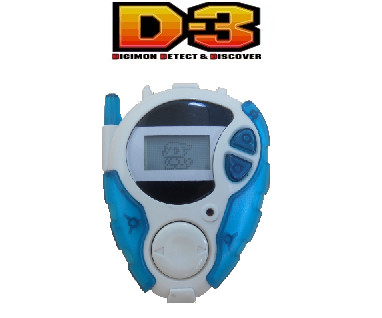 For this Digivice D-3 Version 2, 6 Partners Digimon available to choose from the start which is: Veemon, Hawkmon, Armadillomon, Patamon, Tailmon and Wormmon. Later in the game, You can also use partner from any of the rescued Digimon like Agumon, Gabumon, Biyomon, Palmon, Tentomon, Gomamon, and Terriermon. Parrotmon, MetalTyrannomon, Kimeramon, Ebemon, Creepymon, Ghoulmon, & Wendigomon-Antylamon-Kerpymon. *Main boss appearance is random. – In each Map there will initially be 3 dots, 1 point contains Dark Spire, 1 point Digimon Village (Koromon, Tsunomon, Pyocomon, Tanemon, Motimon, Bukamon, Gummymon), and 1 more point contains Digimon season 1 to battle in order to save them from Dark Spire influences). After the 3 dots are complete, 1 point will appear again containing the Boss Map. 3. 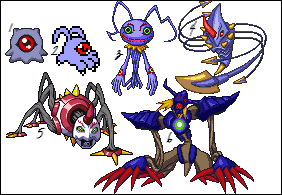 Attack Digimon We grow to 2 (Initially 1), Life also increased to 4 (Originally 3). – When we reach Dark Spire, we must destroy the Dark Spire and defeat the Guardromon guarding it. Only after that our Digimon can Digivolve normally to Ultimate level, not just Armor Digivolve. – To get DigiEgg, You’ll get the new one when you find the egg with a question mark while in game. 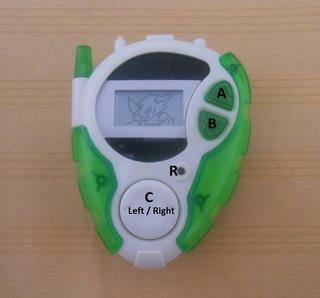 To get a new Digimon party, we will know it when the Digivice ring with the appearance of the question mark on the right & left screen, shake Digivice quickly to find the party. 1. Meet BlackWarGreymon / Mummymon / Arukenimon who will try to kidnap/attack our Digimon, if He succeeds, One of our Digimon Party will disappear (the lost Digimon can be found again) or only the D-Power we have is depleted to 0. 3. Meet SaberLeomon / Andromon that will help you defeat the enemy in the next battle. Defeat Kuramon and the Evolutions! – This map consists of 3 starting points which each end at that point we will fight the following Main boss: Mummymon, Arukenimon, & BlackWarGreymon. – When we battle Mummymon, for the first time our Digimon in Party can Digivolve to Mega level (Automatically & do not reduce D-Power). After successfully defeating Mummymon, Arukenimon, & BlackWarGreymon, there will be no more effort from them to kidnap/attack our Digimon. – First We fight Kuramon, Tsumemon, Keramon, Chrysalimon, Infermon, and the last Diaboromon. In the fight against Diaboromon, use Imperialdramon DM, He will Change Mode by itself to Imperialdramon FM. – After successfully defeating Diaboromon, a cutscene ending appears with all the party of Digimon are seen being gathered & rejoiced.